Do you have days where you sit in front of an empty page – and find nothing, absolutely nothing you could write about? I used to. But now I’ve learned to squeeze inspiration from every experience. What, every experience? Yes, I know it sounds a tall order. Read on to see how it works. Creative innovation happens through communication between regions of the brain that are not usually connected. (You can read more about that here). Does this list inspire you? Does is trigger ideas in your brain? Well, not in my brain! At this point I still can’t find any theme connected to social media that I might want to write about. Now let’s take a different tack in order to kick-start creativity: we’ll choose an unrelated idea and hold it up against our theme ‘social media’. What we’re doing at that moment is to connect two different areas in the brain. Let’s say that the word we choose to connect with ‘social media’ is ‘potato’. Wacky, eh? Just pause for a moment and see what your brain comes up with when you connect ‘social media’ and ‘potato’. Potatoes grow underground and you can’t see them from above / You can’t understand social media by looking in from the outside. Potatoes are a staple diet/ Your communication on social media allows people to get to know the ‘ordinary’ you. Ok – that was just a five minute harvest of ideas to illustrate how creativity works. Even though I didn’t come up with any brilliant mind flashes, what I did get was four different themes for an article. So, if you were to connect ‘social media’ with twenty different unrelated things, such as door handles, cats, rain, hunger, rainforest, or … you name it, you would end up with 100 ideas for articles about social media. That better than none, isn’t it? There are lots of things that can hinder creativity, from low self esteem to a lack of break-fast. But let me focus in on one particular hindrance for now: linear thinking. In term of the way our brain functions, linear thinking means triggering neighbouring ideas. For example, if you use logical thinking, you move down a linear pathway of thinking until you have a result. That’s great for engineers. But not for writers. What we all wish for is to have writing ideas tumble out of our brain continually, so that we always have too many ideas to choose from. Impossible? No, easy! All we have to do is to follow the principle of association that we tried out before. Here’s a list of what I might do next and the post themes for Write to Done this would trigger. You get the idea? Ok, so some of these themes may be non-starters, but they in turn may generate useful ideas. In any case I could head back to my desk with a new collection of ideas for my next post. It sounds easy, doesn’t it? But there is a trick. What does it take to use every moment for creativity? You need to use a trick. Actually it’s not really a trick. You need a particular mind state. Quite simply, you need to be present! For example, if you’re having a shower and you’re thinking about who you’ve got to email today, or about the bills you have to pay, or you wonder why your girlfriend isn’t returning your calls – you won’t create a single idea. Because you’re not present. If you want to be creative, you need to become aware of the present moment . Let the breath lead you to the present moment. A simple Zen way to return to the present moment is to take one complete breath – and feel the air flowing in and out. Then focus on what you are seeing, hearing, or sensing. When you are present, you can squeeze inspiration from every experience. In fact, there’s no need to squeeze because being present makes inspiration flow free. I’d love to hear how this works for you. Maybe you could describe a simple experience and the ideas that flow from it in the comments. Or tell us what works for you to kick-start your creativity. Related article: What Makes us Creative? Great post as usual. I think your last point on being preoccupied is so right as far as a creativity killer. The pressures of our daily lives at times hinder our creative potential. I think a lot of the meditative and focusing techniques you teach and practice can be invaluable when applied to this topic. Wow, amazing post!!! thank you! In many ways, great writing comes from great thinking. Writing can be easy if you don’t “try to write.” I prefer to to think and write down my thoughts. Makes all the difference in the world. In many ways this blogpost reminds me of impromptu competitions. In these particular competitions you are given a quotation and two minutes to prepare a five minutes speech where you analyze the quotation through three points that align to the rationale of the quotation. You learn with impromptu speaking, as you do with the strategies of this article, that any situation can potentially have more twists that you can actually imagine. I think this is useful but i think its very important how your way of writing is, like short sentences, easy to understand texts etc. I often get ideas for my best articles when I think “Oh, that reminds me of…” and connect two normally unrelated ideas! This is some of the best “creativity” advice I’ve ever read, Mary. But when I let my mind wander, usually while driving, the strange and twisted path my thoughts take leads to ideas I’d never have considered otherwise. I’m taking note of the techniques you’ve listed here: I need ’em! Thank you for a very helpful post, Mary! My creativity is triggered by a number of things. One is when something someone says gets stuck in my head and won’t stop repeating until I sit down and write about it. That line played in my head over and over until I had to research Bach’s life to learn more about him. Then I wrote the lyrics much to the delight of our teacher and all of her students. Last week as I sat down to write a blog post, the line from a blues song ran through my head “They call it stormy Monday, but Tuesday’s just as bad.” I love the blues, but since I write a blog about happiness I wondered why I loved the blues. Explaining why I love the blues and how that connects with happiness became the blog post. I’ve learned to buy domains for any combination of words that have potential, so I immediately checked and sure enough ColorYourLifeHappy.com was available. It first became the name of my blog, and now is the name of my upcoming book on creating the life you’ve only imagined. Talk about getting inspiration from every experience, that’s the story of my life. I loved this. Like reading creativity in action. When my Muse is not whispering in my ear, I can usually find her by picking up my laptop and moving to another room, or to the corner cafe. The physical change makes an amazing difference. A way of looking that mostly helps me to get upon new ideas is to take literally what is ment figuratively, or the other way around. It gives me suprisingly images. It’s also one of the aspects of humor to take something the other way it is ment. You can’t turn it into a method, but sometimes it helps to break the spell of being stuck with an idea. You’ve done a wonderful job of taking abstract advice (“make creative connections!”) and giving simple ways to actually act on it. I love the mindset you’re showing us how to cultivate. I’ve recently been trying out ways to work with anxiety. What seems to work really well is to focus on the tightness in the belly, and not on the anxious thoughts. You could try that for 3 breaths and see if it works. Oh, dang – isn’t this a writing blog? I should get off that Zen thing!! I’m glad the potato idea was helpful. As I was writing this article ‘potato’ was the first thing that came into my mind when I was looking for something to hold again ‘social media’. My first thought was, “No, that just won’t work!” But I tried it anyhow! Interesting points. I see what you mean about engineers. You can see how little I know about engineering! I had a vision about gray men in gray suits sitting in gray offices working out how strong a bridge need to be. As to devoting blocks of time to writing. I think that’s good! We just need to learn how to get that Muse to show up at the same time. In order to get your Muse to whisper tender little nothings in your ear, you have to feed her with interesting moments – like tasting the next cup of coffee as if it were the first time. I resonate with what you say. Maybe the trick is to have the mind on an elastic band. Come back to the present…let the mind create some new ideas…come back to the present….let the mind create some new ideas etc. If the mind is too disciplined, like in meditation: creativity suffers. If the mind is too scattered: creativity suffers. “What would I enjoy reading about now?” is your way to kick-start creativity. Love your gloomy morning moment! A sticky note with “Present Moment” on your desk? My gawd – you sound like a Zen person!! I really like and completely relate to the concept that linear thinking hinders creativity. It gives reason to the leaps and bizarre tracks my thinking takes when I’m in the first draft, intensely creative portion of a project! I try to explain to students all the time that plays do not have to be written beginning to end in a straight line…. 1) I definitely agree that connecting two disparate things is a great way to get new ideas. Our minds love solving those kinds of challenges. 2) Linear thinking isn’t that great for engineers either. If engineers only thought linearly we wouldn’t wacky new products. 3) Being preoccupied has both helped and hindered my creativity. If I’m doing something I really really really don’t want to do I’ll often find my mind full of things to write about. If I’m doing something I enjoy doing, though, creativity doesn’t tend to strike. Also if I dedicate a huge block of time to writing sometimes I’ll have nothing to say. Very frustrating. I think you hold the key to social media, I’ve been looking at them for months like a 5 year old looks at a slug, and I can’t figure out what to do next. I think i need to jump in. Thanks for a wonderful post and a great reminder! Sometimes a famous quote by said dead guy can spark inspiration. Some of my blogs have been inspired by a quote that triggers an idea behind it. Reading a inspirational book helps too! We all get writer’s block and it can be frustrating. 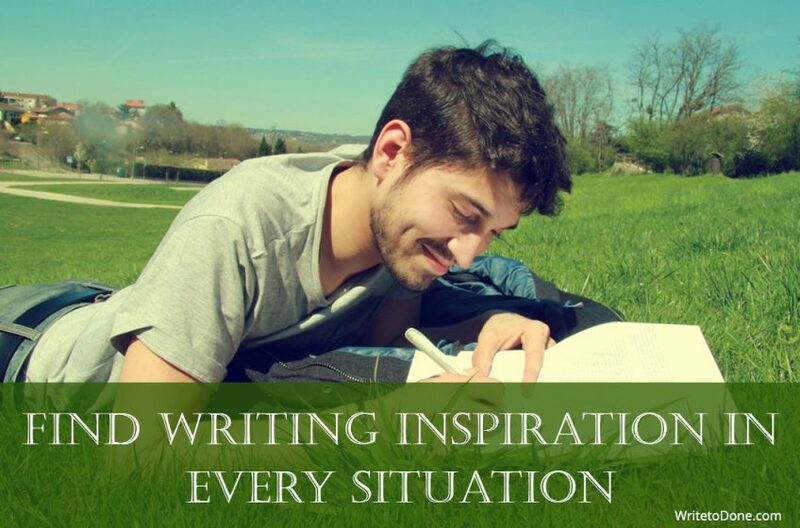 It sure is nice when you are in the writing zone and feel inspired! Great post. Gee, all this time I sat around waiting for my muse to whisper something in my ear and I could have been writing. Who knew? I really enjoyed this article, and it’s very timely for me, as I recently wrote a post over on my own blog about finding inspiration that covered a lot of the same points, only from a nearly opposite direction. While you talk about being present, I’ve always thought that being too present was the death of creativity. Letting my mind wander is usually when I have the best ideas. While in the shower, while walking in the park, while exercising, my mind is bouncing around from subject to subject, and I’m rarely in the moment. The trick, however, is being able to capture sudden flashes of insight. In that respect, I agree, you need to have at least enough presence of mind to identify a great idea when it happens, because letting it slip away is all too easy. What a great idea! I’ve been struggling with getting inspired. I’m going to try this. Great post! Coincidentally, I have “present moment” written on a sticky note on my desk – because this weekend I realized that that’s where the action is, that’s where I have to be when I write. The present moment is where you hear the sound of the train whistle, the brush of breeze on your arm. Even if I’m writing about the past – it helps to be in the present moment. And I liked your potato/social media connection, too. Clutter destroys my creativity. When I’m faced with writer’s block, cleaning off my desk and filing those old papers gives me a clean slate and allows me to get fresh ideas flowing.